A tiling window manager is a type of window manager that arranges your windows as tiles, usually in such a way that makes managing them more efficient via keyboard shortcuts. i3 is my window manager of choice, after having used xmonad for a long time, i3 provides more flexibility and ease of configuration. Here is a great sceencast which will help you understand the power of tiling window managers. i3 does a great job of managing multiple workspaces, even across multiple monitors. While developing I actively use 7 distinct workspaces across two monitors (soon probably three) and having an efficient way of transitioning (alt-#) is critical to maintaining my workflow speed. Most shells today run [Bash](http://en.wikipedia.org/wiki/Bash(Unixshell) however ZSH is an alternative which has great autocompletion and other nifty feature For my .zshrc file, check my dotfiles. In addition, the ZSH framework oh-my-zsh provides some amazing features and shortcuts, definitely work checking out. Powerline shell is a beautiful shell extension which takes care of drawing your prompt. I have customized it based on my ZSH theme to include additional git hints (like ±). 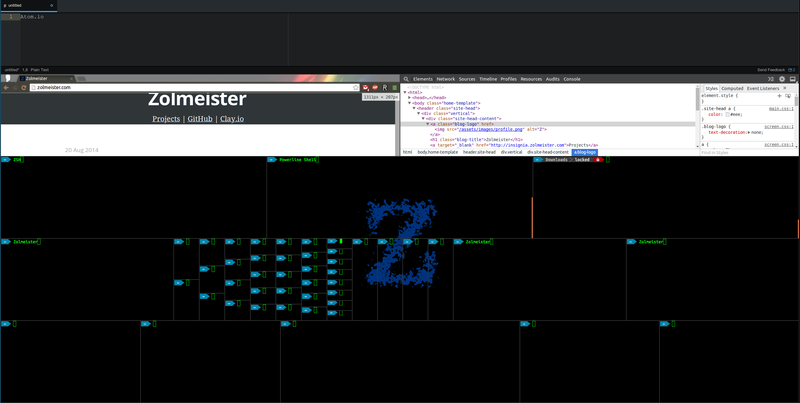 Atom.io is without a doubt the best editor I have ever used. I have used Aptana (good, but bloated), Sublime Text (excellent, but not open source), and Brackets (ok, missing quite a few features) extensively. None of them compare to Atom (I refuse to use an editor that is not open-source, as my editor is a core part of my development workflow and I must have full control over it). Some day I may switch to VIM/Emacs, but have been quite happy with my working speed in Atom. After joining Clay.io I have finally gotten around to building another desktop. The only spec requirements I had were a Linux friendly GPU (Nvidia), 32GB of RAM, and 4k monitor support.